Who you are matters. For a long time. Legacy: noun. "Anything handed down from the past; as from an ancestor or predecessor." My grandmother, Edith Florence (Matthews) Sadler, was a beautiful, captivating woman. She loved formal affairs and proper social etiquette, Opera, sacred music, classical piano and the ocean. Oh, how she loved the ocean. 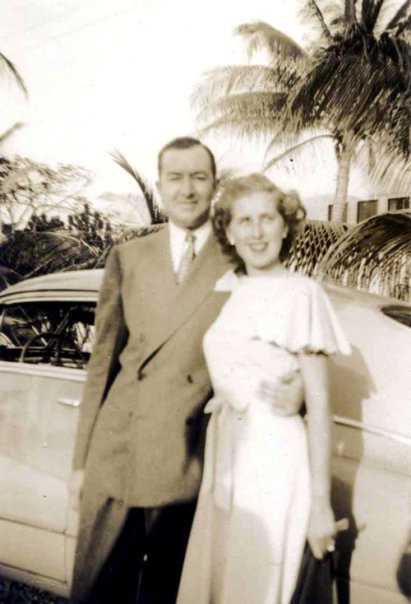 Edith grew up in Stuart, Florida, the darling only child of Sam and Edith Matthews--kissed by the South Florida sun and groomed for a life of admiration. She was the kind of woman you name a boat after. I dreamed about her last night. Not something I've experienced a lot of considering she died when I was 11. I'm fortunate to still have my grandmother on my mom's side and was very close with my great-grandmother until she passed away when I was 25, but this woman - this fascinating, proud, resolute woman Edith Matthews Sadler - even dreaming about her has rattled me. She left behind three children (my dad, aunt and uncle) who speak of her with such a sparkle in their eyes - still completely charmed by their mother, that it's no wonder I feel this way. I am charmed, too. I remember the tight grip she would take on your hand when she held it, her rich vocal texture and perfect pronunciation of each and every consonant, I remember her teaching me the scales on piano, her trained Opera voice singing out each note, the click of her long fingernails on the ivory. I have a memory of her on the beaches of South Carolina, hair blowing in the wind and laughing that infectious, echoing laugh while we watched the fishing nets be drug in. I can still see the color of her Estee Lauder corel pink lipstick and the mark it left on her coffee cup. These are the smallest of memories of her, clips of memories really, but they mean so much to me. They are what I have of her. Her legacy to me was love of music and musicality, my love of horses and riding comes from her, I can only assume my love of proper social etiquette comes from her, too. I hope that in time, I will see even more of her in me -- those inspiring qualities that stay on long after you are gone. A lingering charm. And I hope that one day, I will be the kind of woman you name a boat after.